Silicon Valley chiropractor Poppy Clayton is as calm, cool and adjusted as they come . . . or is she? Known for her bad fashion sense, a love for all things natural and the inability to get a second date, Poppy is beginning to wonder if she might be misaligned herself. Especially since her best friends, Lilly and Morgan, seem to think so. After all, a “normal” woman doesn’t evaluate prospective dates on their liver function and their spiritual balance, does she? Poppy’s route to self discover will be an unnatural one involving a plastic surgeon (of all people! ), a condemned house in Santa Cruz and a wedding date from the dark side. It’s enough to send a girl and her gal pals running for the spa! 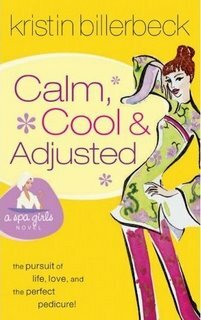 This novel does a great job finishing off the Spa Girls series. Poppy is my favorite character of the three, and this book really gets into her head and reveals more of who she is beyond the health-food obsession and bad clothes. Poppy is STRANGE. But she’s also incredibly unique. More than her weirdness, she values individuality—which is something many young women struggle with—and is a strong heroine. Poppy’s relationship with her father is one of those intangible push-pull bonds that many of my friends have with their own parents. I think this book will speak to women who have dysfunctional families and help them not to feel so alone. Poppy doesn’t have all the answers, but she does her best to trust God in everything. At points in the story, I didn’t quite understand why Lilly and Morgan were so insistent on setting Poppy up. However, I thought the author portrayed the unintentional cruelty of married people to singles very well. I really felt for Poppy. The book also deals with the subject of loneliness for singles very clearly. I could relate to Poppy’s emotions and struggles in this area, since I had felt that myself when I was single. In true Billerbeck style, I didn’t know which guy Poppy was going to end up with until almost the end of the book, and there were still parts where I was kind of anticipating for the other shoe to drop, so it was an exciting and entertaining read. The chemistry between Poppy and her suitors is powerful and sizzles off the page—more so than in Lilly’s story in She’s All That, and even more than in Morgan’s story in A Girl’s Best Friend. Yet there is nothing inappropriate about the language, the topics of conversation, or the action—it’s all very clean. As someone who grew up in Hawaii, I could totally relate to Simon’s feelings about Hawaii at the end of the book. This is a fun book, appropriate for women from junior high school age and up. I think that 20- and 30-somethings will most relate to the plot and characters, but it’s a fast, engaging story no matter what age you are. I just got this book, but I haven't started reading it yet(I was finishing another book). I loved A Girl's Best Friend, and I can't wait to read this one! I loooooove books with clean, yet sizzling romance. my last post, I said I couldn't wait to read this book. Well, I've started it and LOL many times. I just got done with Chapter 15. I got a little misty eyed as Simon talked to Poppy at her childhood home, but at the end of the chapter I wanted to scream, "What's wrong with you, girl?!" but I didn't, since I didn't want to be heard shrieking from the bathtub--lest my neighbors should think I finally crossed that thin deviding line! I love this book so far, and I'm sure I will to the end. Billerbeck NEVER lets me down!